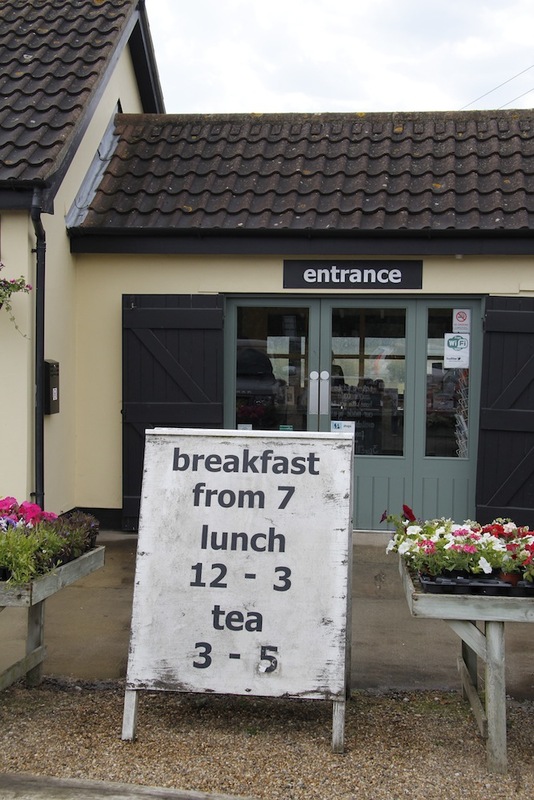 On Saturday we went for breakfast at the Farmcafe at Marlesford which is maybe 20 minutes from us. We also went there on the way back from collecting the bees. They do really very good food and are in the Good Food Guide which is how I came across them. As I love eating out, I thought it might be useful to write some short reviews of my favourite places to eat in case people visiting the campsite were looking for good food. OK, the real reason is that it gives me a perfect excuse to go out for my breakfast and lunch more! 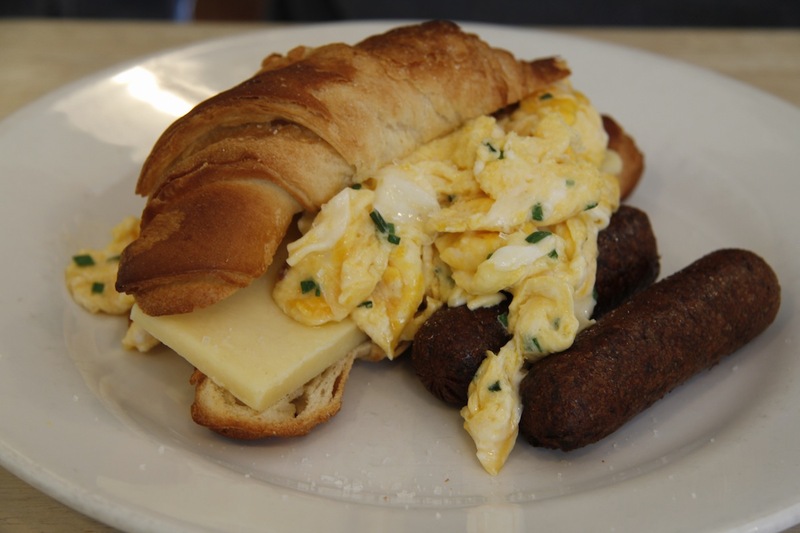 They have a regular breakfast menu that includes filled croissants, cooked breakfasts (including a vegetarian option), Orford kippers (I need to go back again to try this), pastries, smoothies etc. But they also have a specials menu which is very exciting. 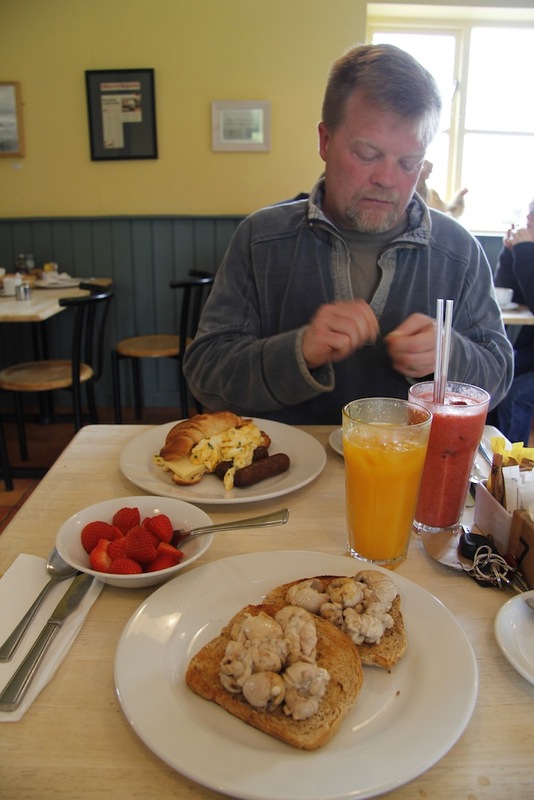 James had a filled croissant (cheese, scrambled egg and veggie sausage), double espresso, large freshly squeezed orange juice and a banana and strawberry smoothie – I think he was trying to get all 5 of his daily fruit and veg in one sitting. 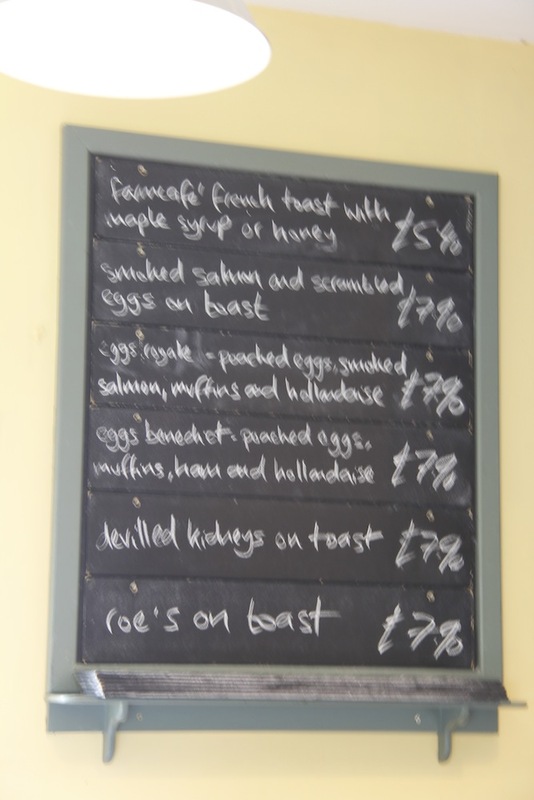 I had roe on toast, latte, strawberries in a bowl and a large orange juice. The food was all delicious. 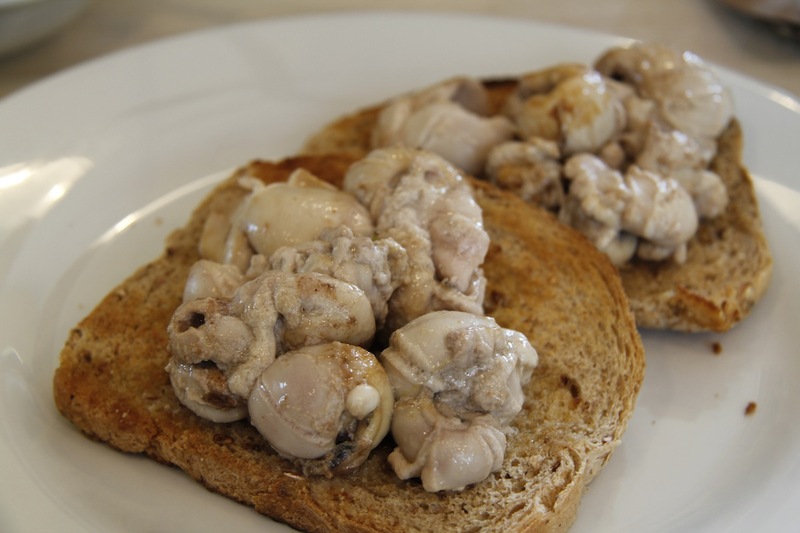 I love the fact you can get slightly different breakfast dishes such as roe on toast and devilled kidneys. It is simply, but well prepared. They do excellent coffee – this latter point is very important! We had a feast and we will go back because I want to try the eggs royale, the kippers and maybe even see what the lunch menu is like. There is a farmshop next to the cafe where you can buy all sorts of things and then just next door is the Marlesford Antique centre. 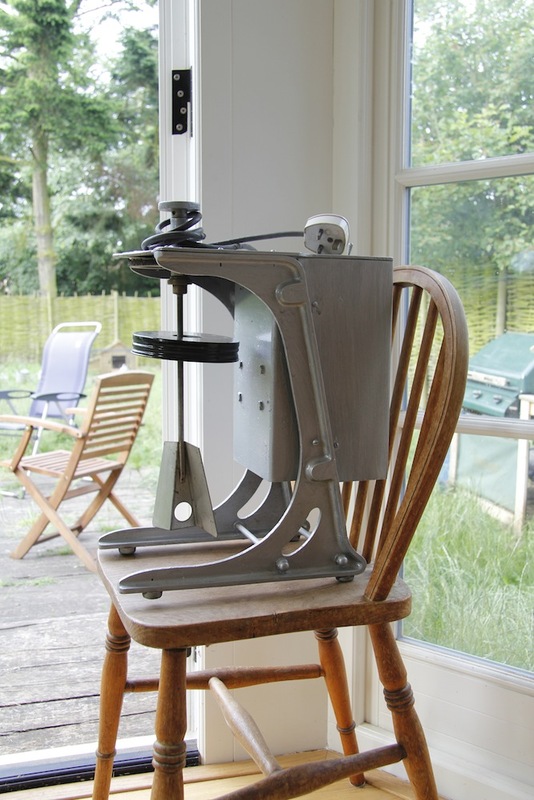 We went and had a look and I found the most wonderful (working) old 50s or maybe 60s electric butter churn. We decided to buy it. Unfortunately we couldn’t work out how to get the glass churn away from the machine so we left it and the woman said she would find out and get back to us. Later that afternoon after an unsuccessful trip to find Leiston bee club that meant I drove repeatedly up and down the B1122 I came back past the antiques shop and they had solved the problem. So I bought the butter churn and a kind person put it in my boot for me. I should have asked him to put it on the floor, but being English and not wanting to make a fuss I left it where he thought it should go. On the way home something awful happened. I got to the Sutton Hoo roundabout (nearly home) and as I went round it tipped over and the glass jar shattered. I am now left with a Blow E75 electric butter churn with no glass jar. If anyone knows where I can get a replacement or if I could use something else instead – I would be very grateful as the whole thing made me cry! Roe looked disgusting to me but the whole breakfast looked beautiful. it was lovely to see James. Hi James! I gasped when I read the butter churn jar broke. So awful. Fingers crossed someone will have a solution for replacing it.